Multi-codes represent the group of services that you commonly render at the same time. For any location, you can reactivate a multi-code that was inactivated previously so that it again appears wherever procedure codes can be selected. If you are not already viewing the location that has a multi-code that you want to reactivate, select that location from the Location menu. 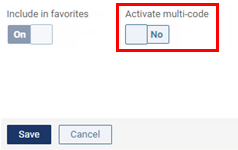 Set the Activate multi-code switch to Yes.